If you're still looking for gifts for your family and friends who love to camp, we've got you covered! 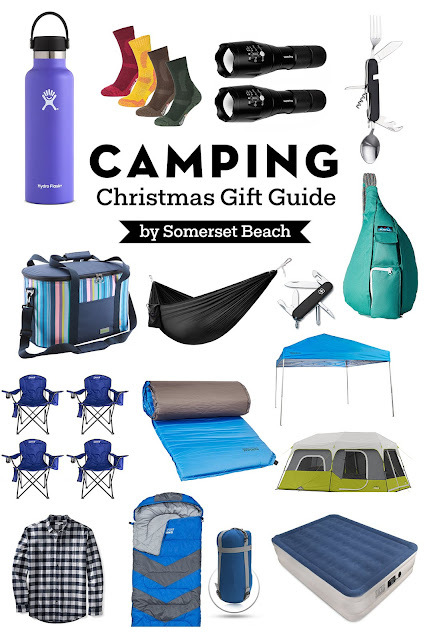 Whether you're shopping for experienced campers, or those just starting out, we've put together a list of gift ideas that are sure to inspire! Bonus: Using the links below to shop will help to support the ministry of SBC! 1. KAVU RopeSling Bag: Sling bags are all very popular right now! They allow you to carry a substancial amount of things without the shoulder pain a regular backpack can bring. The KAVU sling bag also unclips at the bottom of the strap, allowing it to be easy to put on and take off. They are also available in a variety of different sizes! 2. Yes4AllLightweight Camping Hammock: A camping trip is not complete without a slew of colorful hammocks strung across the trees. However, many hammocks are very expensive. 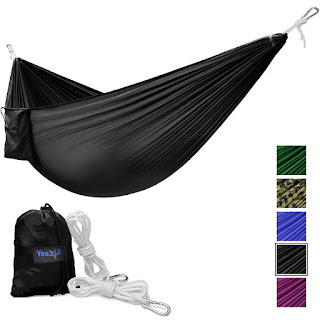 But this durable and less expensive hammock not only comes in many different colors, but it has the option of buying it in the single or a double. It also comes with it’s own straps! It is small, lightweight, and compact. Take your camping experience to the next level with a ready-to-go hammock that will bring some color and adventure to your campsite! 3. 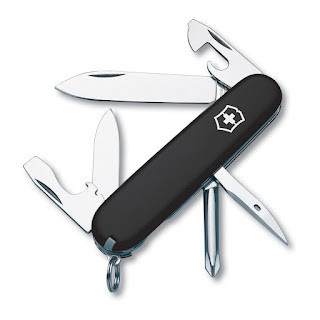 VictorinoxSwiss Army Tinker Pocket Knife: This gadget allows for the luxury of many unique tools in one sleek design. This knife comes in an array of different colors and three different sizes allowing you to be able to customize to your needs! It is stainless steal and has 12 different functions to tackle all your camping needs. 4. CORE 9Person Instant Cabin Tent: This tent allows for up to 9 people to enjoy a camping experience! Although this is one of the more expensive items on the list, the average rating on this tent is 4.5 stars, making it one of the highest rated tents on Amazon! 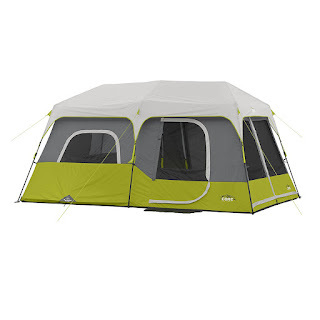 This tent can fit two queen air mattresses and comes with a room divider, adjustable ground vent, wall storage pockets, rain fly, and electrical cord access port! This sent comes with all the necessities that you will need when tent camping! 5. 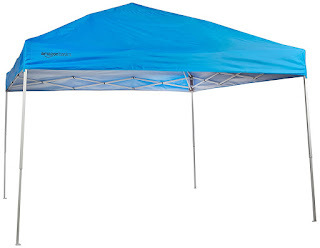 AmazonBasics Pop-Up Canopy Tent: This 10 x 10 foot tent canopy is an Amazon Best Seller! If you are looking for a canopy to keep you out of the sun or the rain, this is the product for you! It is built with a steal frame with a high ceiling for maximum headroom and many other features to make your outdoor camping experience pleasant! 6. SoundAsleepDream Air Mattress: For those of you who love glamping, or love camping but have trouble sleeping on the ground, this product is for you! 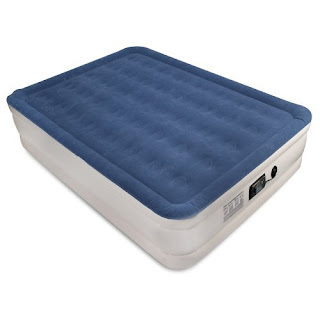 This queen size air mattress is not only durable and allows for full back support, but it includes an internal air pump! So there is no more hassling with bulky air pumps! This air mattress is also water proof and comes with a carry bag! 7. 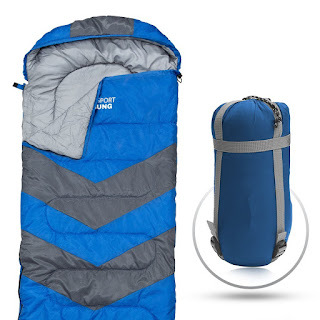 Abco TechSleeping Bag: This inexpensive sleeping bag allows for a comfortable and warm camping experience for all 4 seasons! This sleeping bag allows for maximum comfort with its wide shoulder space and narrow leg space. This sleeping bag makes sleeping in temperatures as cold as 20 degrees Fahrenheit a pleasant experience. This is also a lightweight sleeping bag, avoiding extra weight in your suitcase or backpack! 8. 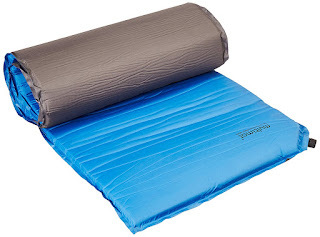 MultimatCamper II Mat: For those who don’t quite need an air mattress, but want some back support, sleeping mats are an essential! This mat has a thick foam core, allowing for maximum comfort! It also includes a stuff sack for sleek and easy travel! 9. Hikenture4-1 Camping Utensil: This small and useful item can be a great stocking stuffer! 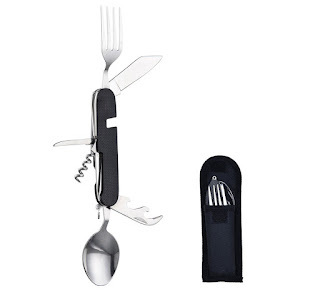 This is a 4-1 tool which includes a knife, fork, spoon, and bottle opener, these are all detachable! It is stainless steel and very durable. It also comes in 6 different colors with a storage case! 10. LED Tactical Flashlight: This 2-pack flashlight set is unique. It comes with many different settings! You can adjust the beam from wide to narrow and 5 adaptable settings (high, medium, low, strobe, SOS). 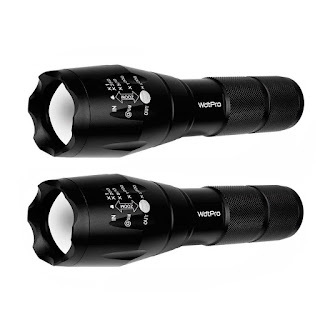 This aluminum design allows for the flashlights to be both shock resistant and water resistant. These flashlights are not only sleek and practical, but is built with many unique functions. 11. 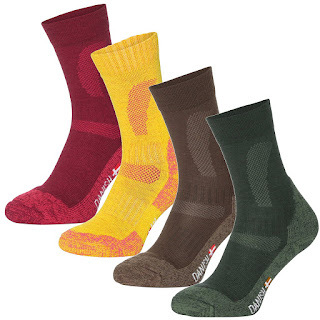 3 or 1 Pack Merino Wool Hiking Socks: These unisex hiking socks come in a variety of different colors! You can also specify if you want 1 pair or 3 pairs. These socks are made with natural anti-bacterial properties to keep your feet warm and dry! They are durable and allow for maximum foot support. These socks are an essential for camping, anytime of the year! 12. Hydro Flask Water Bottle: These 4.5 rated water bottles can keep hot liquids hot for up to 6 hours and cold liquids cold for up to 24 hours. Hydro Flasks are non-toxic and BPA free. They are stainless steel, has a double-wall vacuum, and has no-sweat technology. They can come in 14 different colors and can accommodate many different caps! 13. Yodo Collapsible Soft Cooler Bag: This cooler bag is rated 4.5 stars. This cooler is built with a waterproof canvas and an interior aluminum lining. 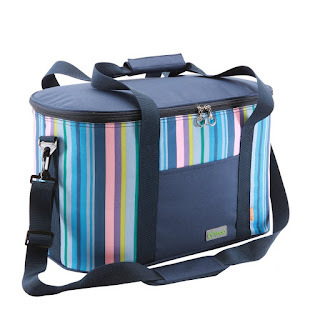 It also includes padded handles and a shoulder strap for easy convenience. It is 25L allowing you to pack everything you need for your trip. It finishes off with outer pockets to carry utensils or other essentials. It also comes in two different colored striped designs. 14. 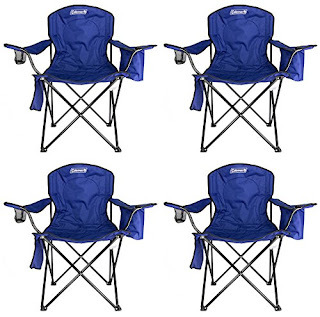 4 x COLEMAN Camping Outdoor Chairs: These camping chairs are perfect for your camping experience! They come with a built in 4 can cooler, a mesh cup holder, side pockets, and a cushioned seat/back. It is versatile and practical. These chairs come in a pack of four, allowing for your whole family to enjoy your camping experience to the next level. They come in a variety of 4 different colors. 15. Amazon Essentials Men’s Long-Sleeve FlannelShirt: No camping experience is complete without wearing a flannel. Flannels are versatile, warm, and can go with any outfit. Even though this flannel is specifically a men’s flannel, the bigger and roomier fit can be extremely comfortable for women as well. So whether you are throwing it over a tee-shirt or tucking it into a pair of jeans, flannels are an essential when camping. And this flannel comes in 11 different colors and 5 different sizes!